It’s a testament to how quickly Swans fans have taken to Michel Vorm that there was comparatively little criticism of his balls-up against Arsenal which provided what turned out to be the only goal of the game. In contrast, Danny Graham’s miss of a sitter at the end of the game was his fourth without a goal and led to a lot of knee-jerk comments about his ability at this level. It’s always the case that fan’s favourites get cut more slack when things go wrong and Vorm’s performance against Man City meant that he became an instant hero. Combined with other heroics such as his penalty save against Wigan and five clean sheets so far this season, Vorm is making a strong claim to being the best value signing this season in the Premier League. 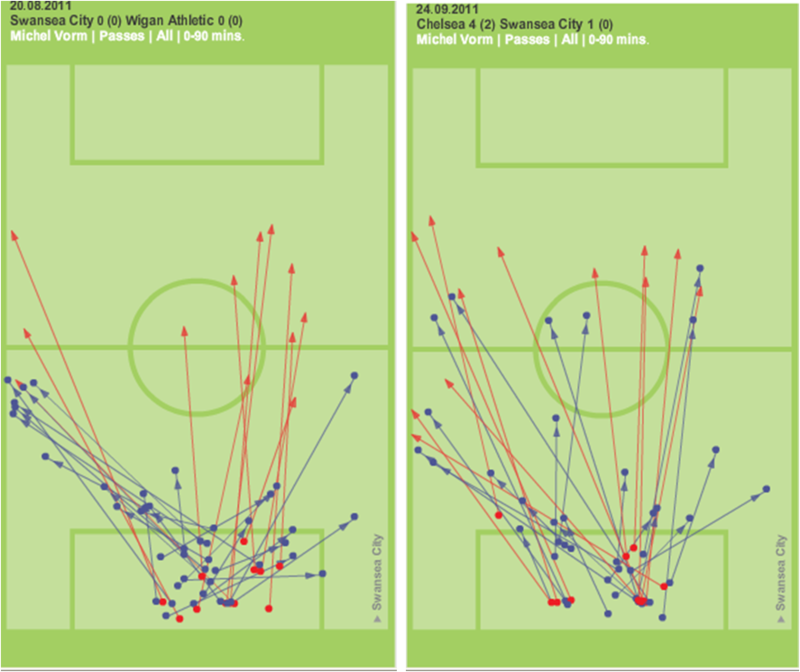 In this blog I’ve focused on looking at his distribution from the back, much was made last year of the passing accuracy of De Vries which would give us the opportunity to quickly start attacks down the wings without having to first go through the defence or central midfielders (which in turn reduces the opposition’s inclination to press). When looking at individual game chalkboards it can be seen that the passing has been a bit of a mixed bag so far and obviously success will depend on the kind of pass that needs to be played. 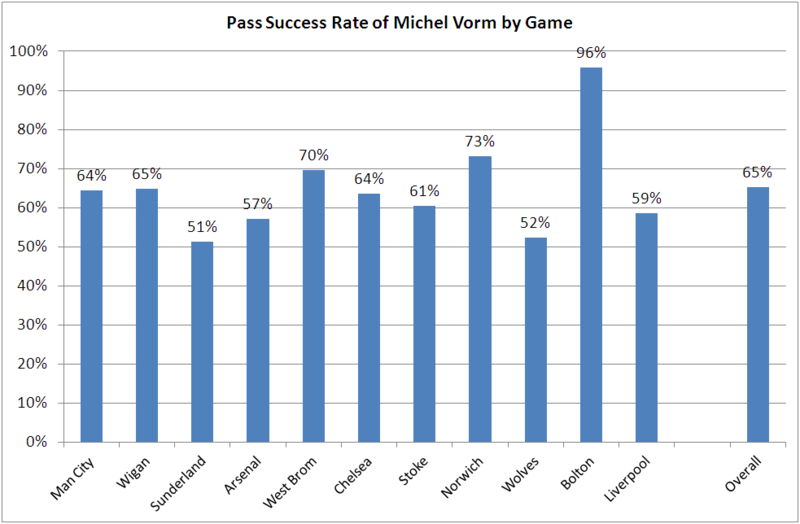 In the Bolton game for example, Vorm had a 96% successful pass rate as almost all were short passes to the edge of the box. The Wolves game in contrast has only a 52% success rate as most kicks are into the opposition half. Bolton's lack of pressing allowed the option of an easy ball to the edge of the box. The Wolves game has a greater proportion of long balls, along with some good passes to the wings. 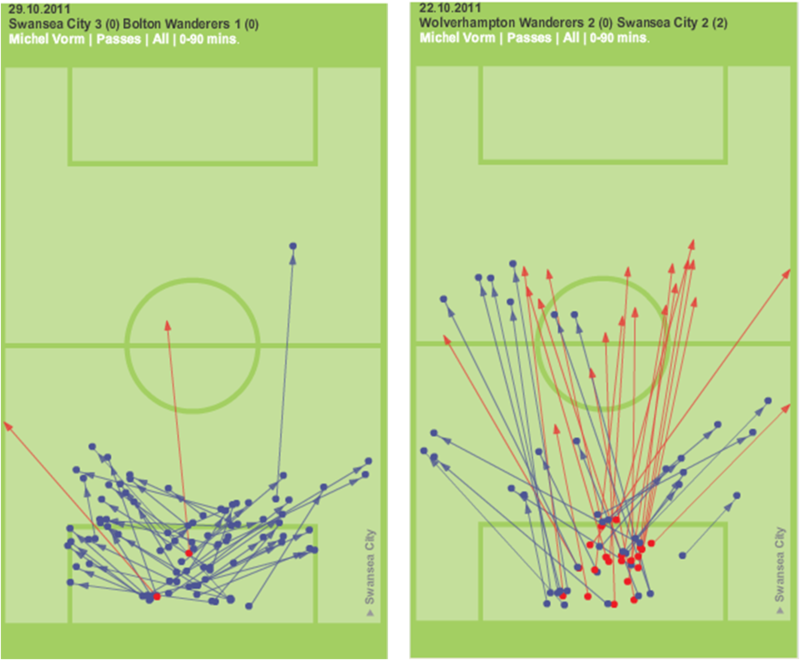 The Wigan game shows a large number of successful balls out to the left hand side almost up to halfway. 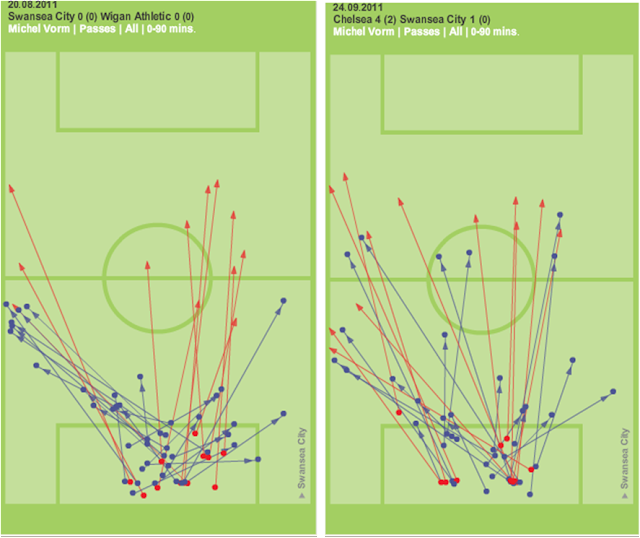 The Chelsea game by contrast shows a number kicks going straight out. In a lot of the games there's been a couple of balls that have gone straight in to the crowd but these are often relatively small margins between a great crossfield ball and it ending up in row G and tends to look more sloppy than a midfielder playing a similarly bad ball too long. In terms of his general play, there’ve been times when he’s seemed reluctant to leave his line and some when he has where he hasn’t been totally convincing. Ultimately, I think it’ll be a case of him being a shot-stopper and relying on the defence to combat any aerial threats which is fine if everyone knows where they stand (both literally and metaphorically). In an ideal world you’d have someone with Vorm’s athleticism combined with a 6’ 6’’ colossus who dominates his box. In the real world you don’t get both (at least not for less than £15m) and in signing Vorm we have been incredibly lucky, especially given how close to the start of the season he signed and have a keeper who could well make the difference in trying to stay up.